High on confidence after their unbeaten run in the group stages, the Indian junior men's hockey team, will start as overwhelming favourites against lowly Oman in the quarterfinals of the eighth junior Asia Cup in Kuantan today. The Indian colts, who booked their quarterfinal berth on Tuesday 17 November after defeating a low spirited Chinese team, have been on a winning streak so far. The Indian colts have remained unbeaten in the group stage so far, defeating Japan 2-1, Malaysia 5-4 and China 4-1. Skipper Harmanpreet Singh has been in good form for India scoring five goals in the tournament so far. Mandeep Singh and Manpreet Singh Jr are behind Harmanpreet having scored two goals each in the tournament. "Yes, we are happy about what we have achieved so far, but here on it's a new tournament for us as we enter the knock out stage in the tournament. 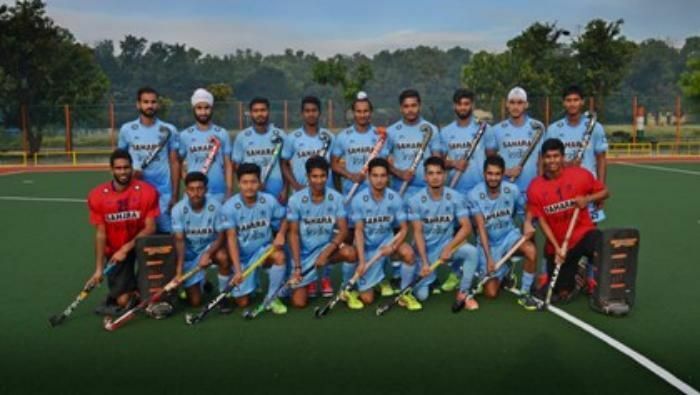 We are aware that we enjoy an upper hand over our opponents in the quarterfinal, but we cannot take this lightly, as it's in a do or die situation where most of the upsets happen," Indian junior men's hockey team coach Harendra Singh said. "Oman is a strong team and our boys are leaving no stone unturned to give their 100 per cent to the match tomorrow. We will stick to our basics and do not intend to test or try any new techniques or strategies especially in the knock out stages," he added. India will go into quarterfinals against Oman as the table toppers in Pool A, while Oman hasn't had a good run at the tournament, losing all three matches.